So on Monday this little beauty arrived at my desk for me to have a play with….my goodness I’m impressed! The gradual tan enhancer is so much more than your standard shop bought moisturiser with a little tan in…this silky lotion uses a generation of patented technology plant Allo- Melanin that mimics the colour of your own melanin…yes really! Applied over 2-3 days on clean, un-moisturised skin, I found it created the most gorgeous natural tan, no streaks or whiffy ‘tan’ smells, in fact…the other half thought I smelt quite lovely whilst wearing it! Its infused with creamy coconut oil (organic of course) and a dash of zesty lime…its truly gorgeous, worth every penny. My tan is natural but still very much visible and I don’t stink of dodgy biscuits when tanning for a change! Hooray indeed. I’m really impressed that Tropic has formulated such a wonderful hero product with Plant Melanin (clever stuff), Organic Coconut Butter and Mango Butter…whilst still retaining its wonderful chemical, paraben and generally nasties free ethic. 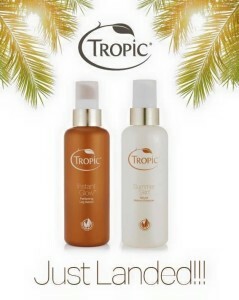 Summer skin Is pure, its natural, it smells great and it works! Bronzed goddess here I come…. (sort of). « Bloomin’ brilliant budget concealer…. Error: Error validating access token: Session has expired on Saturday, 09-Feb-19 07:40:21 PST. The current time is Wednesday, 24-Apr-19 19:43:01 PDT.